Rooms from $121.00 per night. 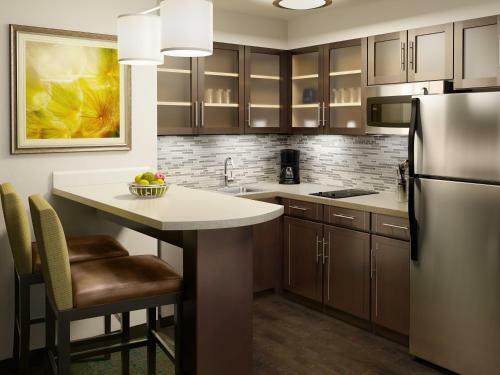 A trendy address suites with full kitchens and freebies like hot breakfast Wi-Fi and a social hour make the non-smoking Staybridge Suites Atlanta - Midtown an appealing option for our guests. Situated on the top floors of Crowne Plaza Atlanta Midtown the six-story non-smoking Staybridge Suites Atlanta - Midtown affords guests 102 modern apartment-style rooms with flexible work space cable TVs free Wi-Fi access living areas and full kitchens with refrigerators microwaves stovetops coffeemakers and dishwashers. Hairdryers and DVD players are some of the other welcome amenities. Business and fitness facilities are available 24 hours a day and a free hot breakfast is served each morning. There's a seasonal outdoor pool to enjoy when time allows and the on-site guest laundry adds convenience. A complimentary reception takes place each afternoon and free newspapers are available in the lobby. Valet parking is available and pets are allowed both for an extra charge. The hotel is in the heart of downtown Atlanta and within a mile of popular attractions like the New American Shakespeare Tavern Georgia Aquarium World of Coca-Cola and Centennial Olympic Park. Georgia Institute of Technology is also within a mile of the hotel. The MARTA transit station is steps from the front door so it's easy to reach everything. It's a 13-mile drive to Hartsfield-Jackson International Airport. Add Staybridge Suites Atlanta - Midtown to your free online travel itinerary.